This week I am reviewing the second arc in an Image series. I missed it when the trade first released, but I finally got my hands on a copy of it at Wizard World where I got the chance to talk with the creators. 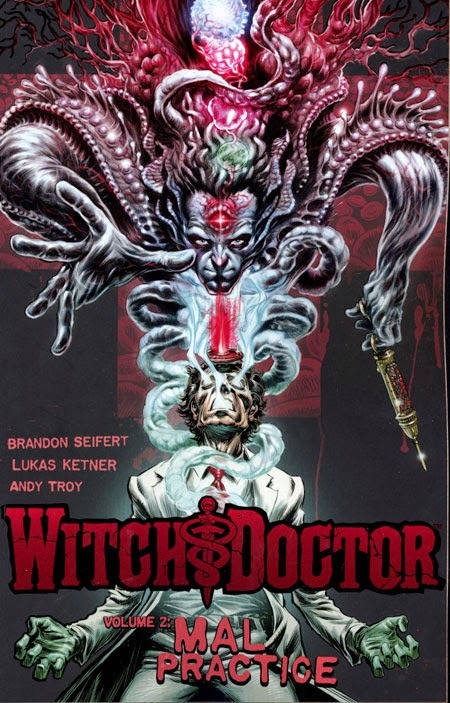 Witch Doctor is best described as being a mix of House and H.P. Lovecraft. It follows Dr. Morrow, a doctor that specializes in “supernatural” ailments. With the help of Eric Gast, a former ambulance driver and Morrow’s assistant. And Penny Dreadful, a small girl who is possessed by a very strong demon. Morrow is trying to stop the coming apocalypse one case at a time. In this volume Morrow is infected with a Strigoi, a vampire type creature which is sexually transmitted. The big downside is that when a strong magical being like Morrow is infected with a Strigoi it is fatal. So for the first time in his life Morrow is trying to save his own life. But he has no idea who is behind getting him infected, or what their endgame is. This arc also introduces Catrina Macbrey an unlicensed Witch Doctor, who is both Morrow’s nemesis and love interest. With every meeting the two are in a constant verbal chess game. Neither really ever getting the upperhand. But at the same time they also make a great team against the larger threat. Seifert writes a strong group of characters that make this series truly standout. Each of the members of the team have their own distinct voices and views on the events that they face. And the world they inhabit is flushed out beautifully with no need for excessive dumps of backstory. There is an enjoyment in his writing of this series. Ketner has a refined style with a great rough line that adds some extra atmosphere to the story. And when there is need for the more Cthulu-esque aspects like the Strigoi creatures, Ketner makes them simultaneously beautiful and horrifying. I couldn’t picture Witch Doctor being drawn by any other artists. This series continues to be really fun. I look forward to the third volume starting up in the future. Thanks for reading my review. If you have any questions comments or suggestions please leave them in the comments section. And as always keep reading comic fans.